Last week Monday I took a personal day so I could take Cortney to the hospital for a scheduled, routine procedure: a colonoscopy. Now don’t worry I know, I know. He’s way too young for a colonoscopy. He had an issue. He has family history of crappy stuff. Ipso facto he went in for the procedure just to make sure things were fine. And they are. I brought him in at 8:45am to get him all set up and ready for the 9:45 procedure. He was sick of not eating and doing the prep and he just wanted it done. We listened to all the nurses and doctors about how it would go and what I could expect him to act like when he came back from the procedure (loopy and out of it). Eventually they wheeled him out and I settled back to get some work done while I waited. When he came back, he was indeed loopy. In fact, he wasn’t really totally awake yet at all. It was more unsettling to see than I was prepared for. 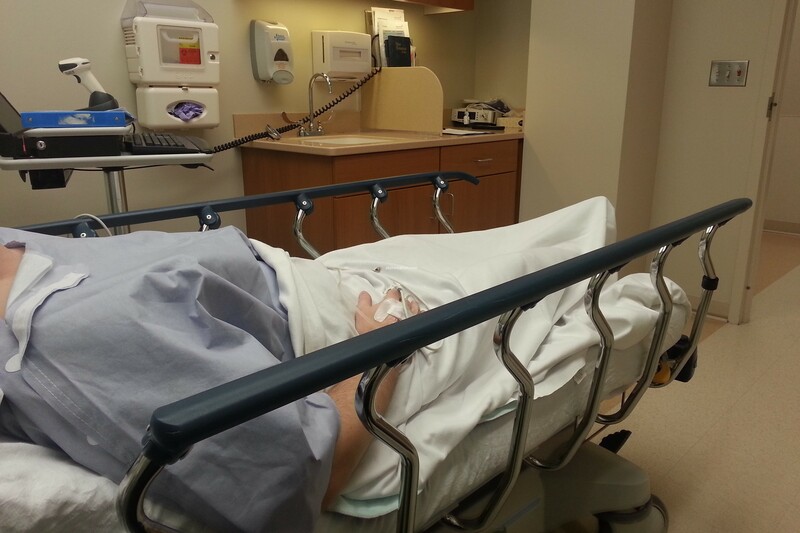 In the ten years we’ve been together, Cortney has had one surgery: his appendectomy. His dad had died early that day and by the time I drove Cort to the ER I was in survival mode myself. That day is a blur of forgotten and acutely remembered moments. I didn’t see Cortney until after he had been in recovery and woken up, albeit still acting silly and flirty with the nurses. This past Monday he was still not actually eyes-open-awake yet when I saw him. He mumbled some things about football and licked his dry lips a few times. I figured he must super thirsty since he hadn’t had a sip of anything since 6am and it was almost 11am. His eyes struggled to open and he said in a low voice that he was just so tired. I held his hand. The one with the IV in it, and something punched me in the chest. I’m not entirely sure how to describe it other than to say it was like when people talk about their life flashing in front of their eyes. Only, it wasn’t my past life that flashed, it was our future. Simultaneously all the still frames of his dad’s sickness flipped through my consciousness like a Rolodex on speed. It was like one of those nightmares that is terrifying and extremely vivid while it’s happening, but the second you wake up it starts to go away from your visual memory, but lingers in your feelings memory. I clutched his heavy-hand and forced myself to be calm and swallow down the anxiety. I slowly rubbed the back of his hand with my thumb and said gentle little things to him. I refused to let myself close my eyes because I knew the images were there. The ones where we are old, but not old enough. Never old enough. Where I am holding a wrinkled and grayed version of that strong, soft hand. The visions that have me wondering how I will go on without him. The images being there were startling and disconcerting and very much blended with his dad’s last days in the hospice bed. I gasped at the realness of it. My eyes burned. But before I could lose my breath completely, a doctor or nurse came in, and Cort became a bit more lucid, and the moment passed. We moved on with what came next. Cortney requested apple juice and the proclaimed it to be the best damn apple juice he’d ever had. The moment had passed. Because that is what it was: a moment. All the feelings and visuals and possible heartache happened in less than a minute, and just like that it was gone. We were in the present again. When the doctor gave us the boring news we were expecting, I could have hugged him. We were expecting there to be nothing, and there was nothing. But that brief moment in time–that flash of past and future–made me so very grateful for a boring present. I refuse to think of the faraway, scary future. I’ll take the boring present any day too. Yes to the boring present. So glad everything was okay. Oh my goodness. You totally had me in your moment. It took my breath away. I’ve been there, with both the boring present and the very real scary future, and I will gladly take the boring present forever and ever. I’m glad it was just a moment that passed for you. I have these exact same moments with my husband ALL THE TIME. The thoughts come completely apart from my control. I have to literally shake my head to try to make them go away. But then, my husband is chronically ill, so the danger of losing him is very real and present for me. So yeah, I completely understand what you felt, and am glad it’s not your reality right now. Jennifer Hall recently posted…How do you DO the Holidays? I’m all about the boring present. Although my present is truly anything but boring these days. Glad everything went well for hubby. Tears in my eyes. I just love posts like this. I just love news like this. oh lady, I don’t really want to go that far into the future either. Sigh, I’m glad all is well for today and tomorrow and now. I did something similar after my mom passed. I had to take my sister to the hospital mom was in at her death to get some tests done. To get there you have to park in a garage and ride a shuttle to the actual hospital. I felt the panic rise in my throat just entering the garage. I had avoided this place for nearly a year for this reason. I was quiet as we got on the shuttle, recognizing the driver and the assistant that was there. They also recognized me and spoke asking how we were and I gave vague answers. It was horrifying and painful and scary. My sister was fine, but that day seemed to stretch forever for me. I ran to get out of there certain I was going to pass out from the feeling of choking. I am so glad Cort was alright hun. I cannot imagine the hardness of remembering when his last surgery was and the memory of that day as well. oh my goodness – you had me so in that moment with you and I had to stop reading and wait for the blurred vision to pass. That is definitely the place we moms do not want to go. even briefly. So glad that everything turned out good…..and so boring! So beautifully said. Having just lost my mom this month I can say that being hit with the reality of our mortality is a hard blow. Going from someone being so full of life & the light of the room to death is really hard to wrap your head around. It’s those things that really make you take a good hard look at your life, those you cherish & take note of the important things. Priorities change. I’m sure that is part of the lesson we are being taught – but that doesn’t make the days any easier to go through. Thank you for such a raw & open post. I felt very similar to this when David had his colonoscopy. There is something about seeming them laying in that bed that makes your gut clench.